This clean eating Indian Saag Recipe gets myself and my children to eat more veggies. My family has seriously been on an Indian food craze. We love it so much. It is a meal that we can all eat together and enjoy! Not to mention Indian food has so much flavor and taste – it leaves you wanting more and more. Since it can be expensive to go eat out for Indian food, I have been on a mission to get some great recipes to have on our frequent list of meals for dinners. I like how the spinach is so transformed, you can’t even tell it’s spinach. Well, other than the color. Because of that, my kids will eat it and they don’t even know it’s healthy. Our family first tried Indian food a few years ago when we were adding on to our house. It was a HUGE addition and took four months (during the winter with several weeks of the outside wall partially missing, totally missing or with an uninsulated room. We used the garage to set up a temporary kitchen complete with an oven and fridge. No dishwasher though. Our garage is an old converted carport and you can see daylight through the walls in many places. It was VERY cold. I could see my breath out there every morning. I often resorted to turning on the oven and opening the door cause the portable heaters we used were pretty much useless. Let’s just say, it seemed like forever, and I used every excuse I could think of to go out to eat a lot. Well, after a while of that, we were sick of our regular restaurants and pretty much sick of eating out in general. My husband would often stay at home since he has so many food allergies he can only eat at a handful of restaurants. Either that, or he was eating something real quick and then cleaning up the construction dust so we could come in the house. So one night I told the kids we were going to try something new and they had to try it, whether they wanted to or not, and they couldn’t complain and they had to try it. But I wanted to pick the place to eat for once and they could have leftovers if they didn’t like dinner. Well, guess what? They LOVED it. They especially loved the tikka masala. We ended up going to the same Indian restaurant so many times that the workers there knew us. My children are mostly stuck on tikka masala and like it enough that they see no reason to try anything else. I like tikka masala fine, but I don’t like how it’s made with chicken breasts. 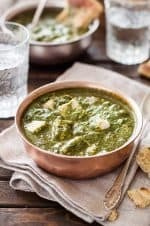 I prefer an Indian saag recipe with chicken thighs because they are much moister and have a deeper flavor. Although, we do try to eat vegetarian on occasion, so that’s why I made it with Paneer cheese this time. Check out my Yeast-Free, Quick Naan Bread recipe that goes perfectly with this recipe. 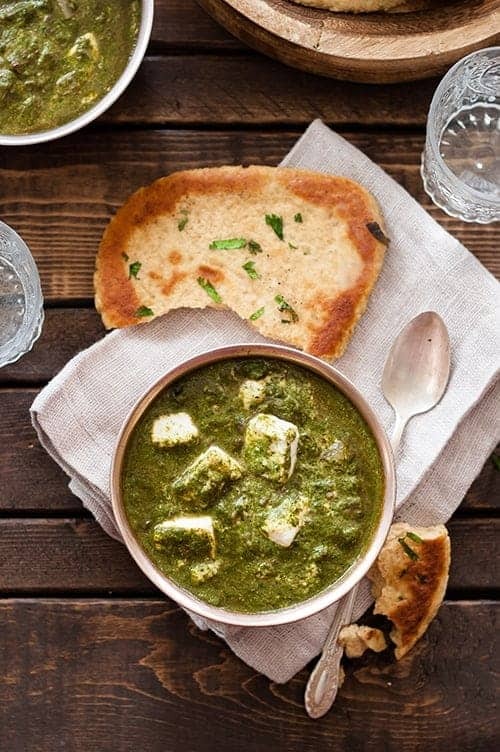 Indian saag is traditionally made with paneer cheese and I made my own paneer cheese for these photos. It’s incredibly easy to make and only involves milk and lemon juice. Paneer cheese bought in the store works wonderfully as well, of course. 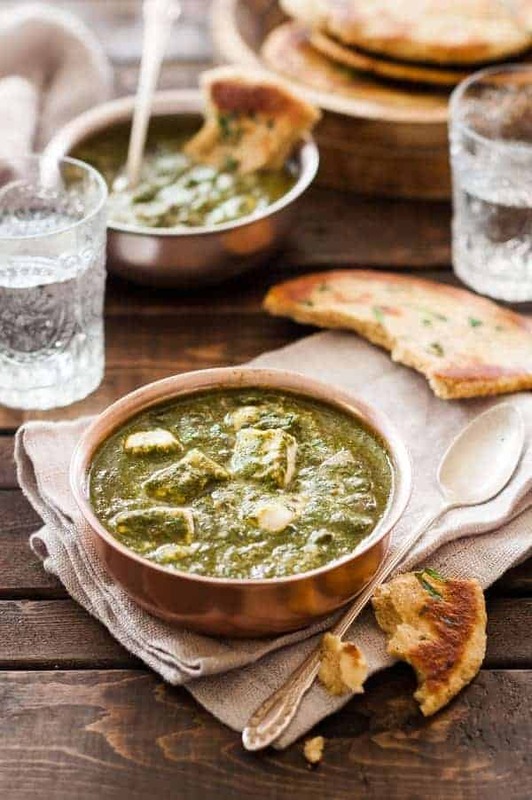 The Saag can also be made with chicken or lamb if you prefer having a protein in your dish and that will make it Paleo. 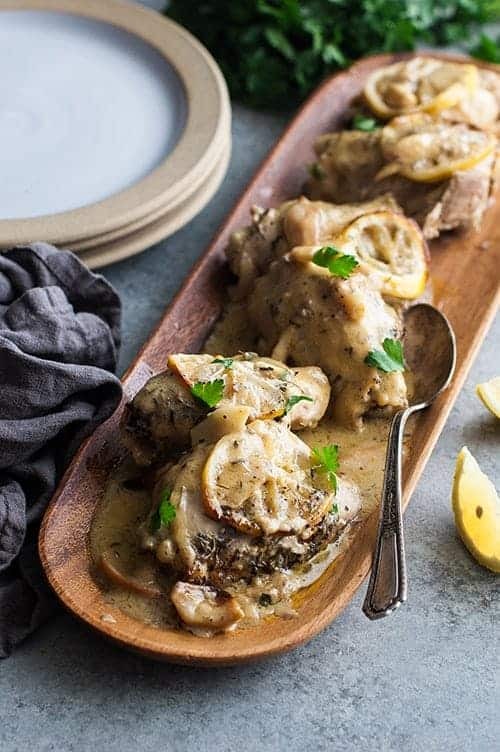 Try it with some steamed, mashed cauliflower or cauliflower rice for a Paleo and Whole30 option or with rice for a gluten-free diet. For a Clean Eating diet, try short grain brown rice or quinoa. The coconut milk may be subbed with cream, milk, almond milk, etc. It’s such a small amount of it, that it doesn’t matter all that much. I like it with coconut milk, but I often don’t feel like opening a can of coconut milk and taking out such a small amount, so I often just use heavy cream ’cause I LOVE heavy cream. This Paneer is simple to make and full of nutritious ingredients. I would love to know if you try it and any variations you make with it and who you make it for. Place spinach leaves and water in a saucepan and cover with a lid. Bring to a simmer and cook until leaves are tender. Transfer spinach and remaining water to a blender. Puree spinach until smooth and set aside in a small bowl. Puree the fresh tomato until smooth. Set aside in a small bowl. Heat the olive oil in a large saute pan over medium high heat. Add the onion and saute for 2-3 minutes, or until soft and translucent. Add the garlic, ginger, garam masala, cumin, and salt, and saute for another minute. Pour in the tomato puree and cook for 1 minute. Add in the spinach puree, paneer, and coconut, stir gently, and cook for another 5 minutes on medium heat. Check seasonings and add more salt, if desired. THIs looks amazing! What’s Paneer? Is it whole 30 approved? Thank you! It’s a special kind of fresh Indian cheese, definitely not Whole30 approved. To make this dish Whole30, I just sub the cheese for some chicken breast. Easy and works great. Was so good! Hubby said best paneer he’s ever had better than any restaurant. I made a couple modifications only because I’m not vegan or paleo. I didn’t have coconut milk (used plain yogurt) and used tofu not paneer. Can’t wait to make it again! I’m so glad you like it and that you weren’t afraid to try it and make some modifications. It really is good and really so much easier than I thought it would be. I’m glad you tried it. Thanks for commenting! This was delicious, thanks for the recipe! This looks so good, I want to add some chicken to it and eat it for lunch.